The Emergency Unit of Kowloon West (EU KW) conducted an annual joint counter-terrorism (CT) exercise with various units at Mong Kok Stadium on November 9. This year, the exercise evolved from a tabletop simulation to a ground drill in a bid to enhance the co-ordination of the units in dealing with terrorist activities. The concept of Immediate Tactical Intervention was promoted to frontline police officers. The exercise, codenamed "DAYTOWER", simulated a terrorist attack on an international football match at Mong Kok Stadium with over 3 000 local and overseas spectators. A number of armed terrorists used a vehicle to ram into the stadium and attacked the spectators in an ambush. Officers made Immediate Tactical Intervention and evacuated the stadium to neutralise the threat. 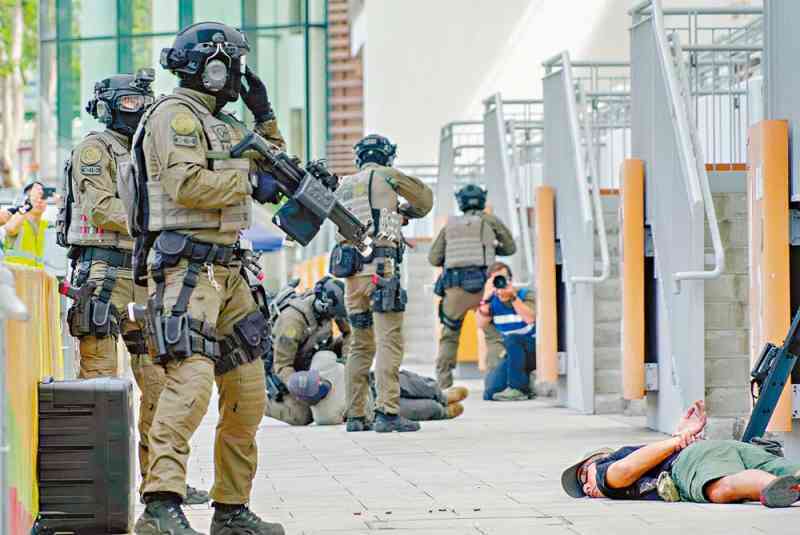 A total of 212 representatives from EU KW, the Counter Terrorism Response Unit (CTRU), the Police Dog Unit, the Police Tactical Unit Yankee Company, Mong Kok District, the Leisure and Cultural Services Department and Hong Kong St John Ambulance took part in the exercise. Moreover, the Police Recruitment Division engaged 435 students of universities and tertiary education institutions, who are members of the Police Mentorship Programme and Project ACHIEVE, as actors in the exercise. Furthermore, 35 community leaders, including Yau Tsim Mong District Councillors and Yau Tsim Mong District Fight Crime Committee members, attended as observers. After the exercise, a Police Exposition with a display of CT equipment was held at the stadium to let the student participants learn more about police work. The community leaders said the exercise had enhanced public confidence in the Force's CT response capability.